"I love pasta but it is not always the healthiest thing to have for dinner. To make this one a little less guilty, I use turkey and add a carrot to the sauce. So tasty!" Preheat oven to 350 degrees (175 degrees C). Lightly butter a 9x13-inch baking dish. Bring a large pot of lightly salted water to a boil. Add ziti pasta and cook until al dente, about 8 minutes. Drain. Heat a large skillet over medium heat; cook and stir onion and ground turkey until onion is translucent and turkey is no longer pink, about 7 minutes. Add spaghetti sauce and carrot; simmer until heated through, about 15 minutes. Layer ingredients into prepared baking dish as follows: half the ziti, Provolone cheese, sour cream, half the sauce mixture, remaining ziti, mozzarella cheese, and remaining sauce mixture. Top with grated Parmesan cheese. Bake in preheated oven until cheeses are melted, about 30 minutes. 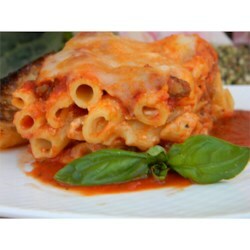 This recipe is a healthier version of Baked Ziti I.
very bland, did not like the carrots. Will not fix again. Delicious, very hearty. Added some mushrooms as well. A good recipe. I cut it in half (except for the meat) and put it in an 8x8 pan.